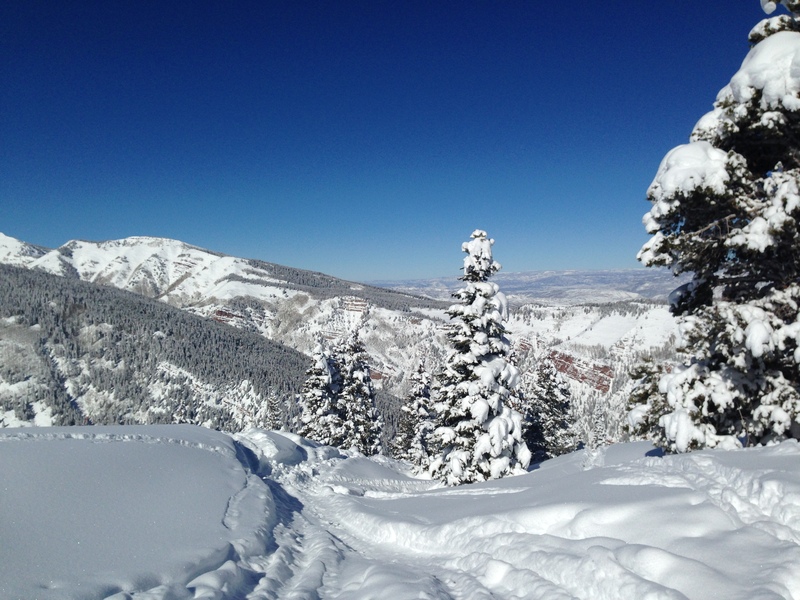 Skiing and Swimming go together like…. This entry was posted on March 6, 2014, in Swimcrest Thoughts and tagged Breathing in vs Spacing Out NYTimes article, Similarities between skiing and swimming, Skiing and Swimming, Swimcrest Facebook. Bookmark the permalink. I am no ski expert. In fact, far from it. This year, however, I’ve skied more than in any previous season. Aspen, Beaver Creek, Vermont, Massachusetts. I’ve skied deep power and straight up ice. I’ve fallen too many times to count, and am still nursing a pretty sweet bruise on my hip from a fall on the ice at Sugarbush two weeks ago. I’ve skied in blinding snow, and blinding sun. 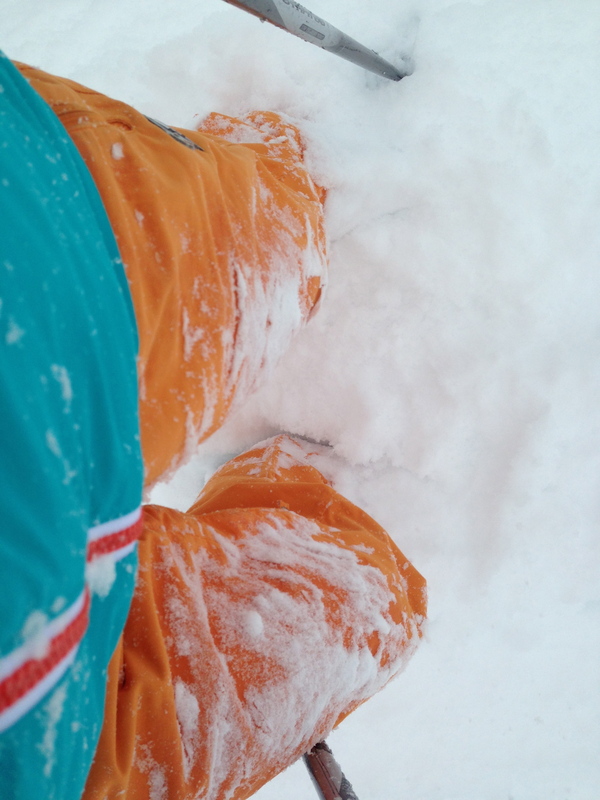 I’ve skied in rain. I’ve skied on days the windchill made it 10 below, and on days when it was so warm, it felt like Spring and I was sweating. I’ve had numb toes and overheated fingers. I’ve had foggy goggles, days when I couldn’t see because the light was so flat and dark, and days when it was so bright, my goggles weren’t dark enough and I spent the day squinting. 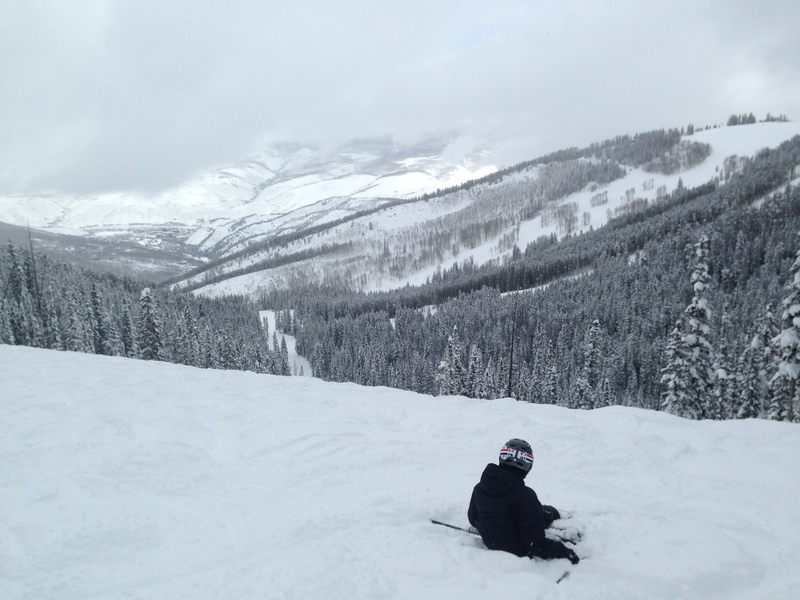 I’ve skied moguls and double black diamonds and green runs and in the woods. I’ve done some jumps, and avoided a lot of others. For me, the season ends this coming week and I have spent a fair amount of time thinking about why my skiing has gotten better over the course of this year as opposed to all of the other years I have been doing it. I’ve also spent a lot of time thinking about how my practice of skiing relates to my swimming, and the ways swimmers are a lot like the skiers I watch from the lift. I watch new skiers a lot. It’s one thing to watch those effortless looking experts who zip down the slopes and look like they never catch an edge, don’t have a care in the world, and unlike me, aren’t thinking about when the next fall is going to come and how much it will hurt. They are enjoying. They are thinking, I’m sure, but they are letting go and just skiing. They are beautiful to watch and I love the gracefulness I see in them. I learn a lot about skiing from seeing how they transfer their weight, and how they pick a line down a mogul run or carve fresh tracks in new powder. The common link is tension. Nerves. An inability to relax and let go. If you ski at all, you know what I am talking about. We’ve all seen them. New skiers look hunched over, their arms rigid and their legs locked in that pie shape we’re all taught to make. They look as if they are anticipating disaster, like they are constantly hyper-alert, waiting for someone to run into them or to miss their turn and end up in the trees. Generally, they don’t look like they are having fun. They look like every muscle in their bodies is taut, ready to snap and you can see them thinking and hyper-focusing on every movement. I have had that look. Plenty of times. Skiing is hard and can be scary and means a certain amount of relinquishing control to gain mastery, and ultimately, more control over your skiing. When I see new skiers, I am aware that holding tension in your body is very different from having your muscles ENGAGED and working for you. Tension breeds exhaustion and when I ski tense, I am emotionally and physically tired much faster than when I let my mind go, and let my body follow. Those fantastic skiers who make it look like so much fun? They don’t look tense. They look rhythmic and loose. New swimmers often hold that tension in the way of new skiers. They hold their breath rather than exhaling, their chests taut and their bodies stiff. They move their arms rigidly, almost robotically, when taking their first strokes. They fear the deep water like new skiers fear a black diamond. A major part of what I do is helping people to let go a bit. I do things to help people feel the water more comfortably, and help them let go of that newbie tension. Some of it comes from practice. 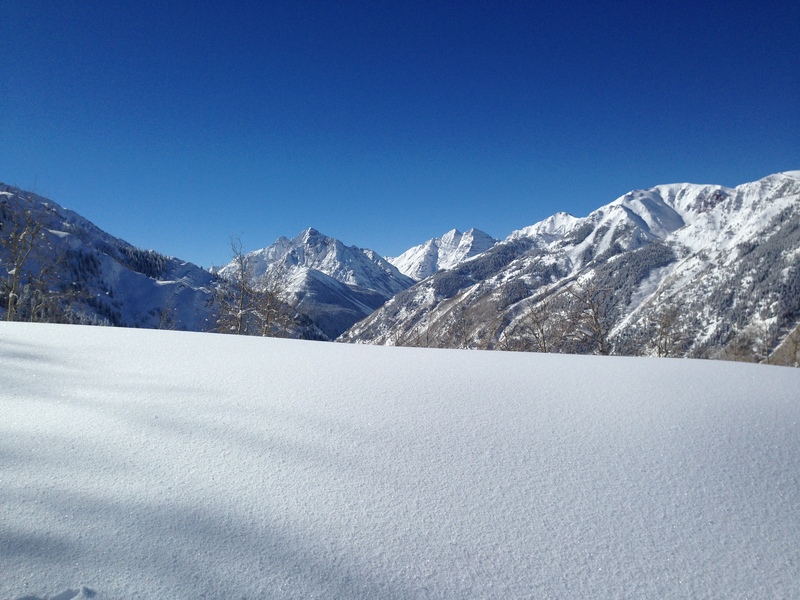 I skied enough this winter to really cement how I felt on the snow–and in the case of 35 inches of powder in Aspen, how I felt IN the snow. I skied consistently and regularly. Repetition takes some of the unknowns and fears away and as you learn, your body eases into your practice and lets you be more at home in your element, whether it is snow or water. When people come to me incredibly nervous and don’t try to swim at times other than our scheduled session, I know that it’s going to be a longer road for them. Like my relationship with the snow, our relationship with the water is dependent upon developing familiarity. You can’t expect to come to the water once, feeling that stress and anxiety, and have that vanish immediately. It takes getting to know each other, getting to understand how your body feels in the water, how you move through it, and how you manage differences in the element. Waves, open water, a pool where you are sharing a lane with someone who swims “over” on your side too much, a workout where you are trying to keep up with folks who are faster. In my own swimming, I do this every single time. I spend my warmup feeling the water, establishing my breathing, thinking about my body and how the water feels. Sometimes, that doesn’t work. I get too caught up in the mental crud. When I am having one of those tension runs on my skis, and I can’t settle down, I take a moment. I stop on the mountain. I look out. I take a breath. I talk to myself and try to calm my body in the same way I do when competing in a long open water swim. I ask my swimmers to do the same thing. Sometimes, when I can tell they are swimming tense, I stop them and just talk. About anything. It might be swimming related, it might not be. It’s always something that will distract them for a moment and allow them to breathe without noticing it, to relax their shoulders, and to calm their minds. Then, I ask them to swim again and inevitably, they look and feel better. I might ask them to imagine themselves swimming, seeing themselves in their minds snorkeling in the Caribbean or competing in a Half-Ironman or just hanging out in the water with their kids. Immediately, I watch their stress abate. Rather than a hyper-focus on their left hand or their, it allows them to swim. They still do the work and reflect on their practice, but it comes from another direction. It becomes less about consistent and total perfection and more about enjoying each stroke as it comes. Do we still need to be mindful of that hand or the rotation or the exhale? Yes. But not to the point of paralysis and stress. Recently, an article in the New York Times entitled Breathing In vs. Spacing Out discussed Mindfulness and how, while the benefits of practicing mindfulness are many, there are downsides too. In 2012, Jonathan Schooler, who runs a lab investigating mindfulness and creativity at the University of California, Santa Barbara, published a study titled “Inspired by Distraction: Mind Wandering Facilitates Creative Incubation.” In it, he found that having participants spend a brief period of time on an undemanding task that maximizes mind wandering improved their subsequent performance on a test of creativity. In a follow-up study, he reported that physicists and writers alike came up with their most insightful ideas while spacing out. “There’s so much our brain is doing when we’re not aware of it,” said the study’s leader, Chelsea Stillman, a doctoral candidate. “We know that being mindful is really good for a lot of explicit cognitive functions. But it might not be so useful when you want to form new habits.” Learning to ride a bicycle, speak grammatically or interpret the meaning of people’s facial expressions are three examples of knowledge we acquire through implicit learning — as if by osmosis, without our being able to describe how we did it. My son is a “natural” and graceful skier. He is relaxed and fun to watch and clearly enjoying himself. He works on things like improving his parallel (although his skis are already so close together, I can’t imagine how he will do more), and checks in with himself about things he’d like to improve. For the most part, however, he relaxes and skis. I see this in effect in my teaching with students who focus so intently upon their movements, they become a series of disconnected parts, removing their ability to work as a system. When they are able to “let go”, and let their minds wander while still engaged with their practice, they become better swimmers. It’s the same with those hunched over skiers who will, one day, become better skiers. When I ski these days, I try to imagine myself skiing. Mindful and yet letting things happen, letting my mind and my skis wander. 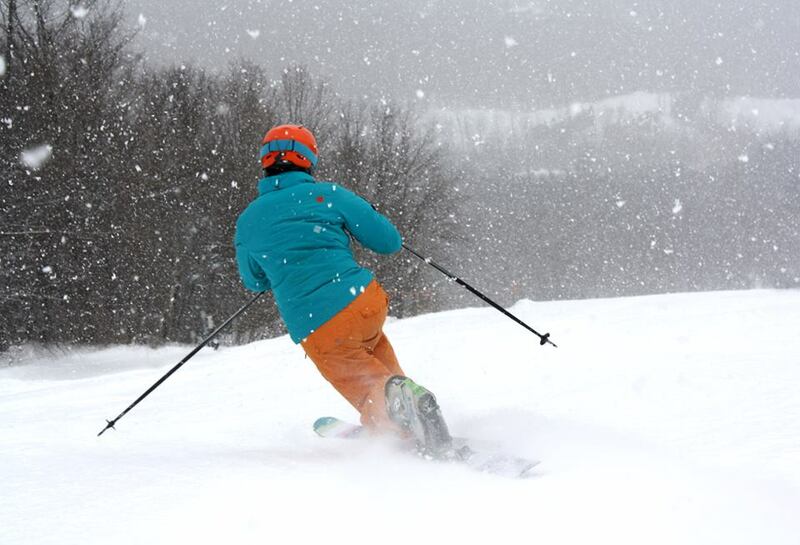 Just another one of those gliding, seamless, carving skiers enjoying the freedom of a day outside. It always makes me a smoother and better skier, enjoying every turn as I go. If you ski, I hope you’ve had a terrific season and that you manage to get a few more runs in before it’s over and we get ready for Open Water Season! Hope to see you in the water soon.